This is a room in my house, from a couple of years ago, when I had scarcely a moment to breathe. This room, like many of your rooms, became the catch all room; the room I could close the door and ignore. During this period of my life, so much was coming at me, that emotionally I could do little more than eat, sleep, work, and take care of my family the best I could. 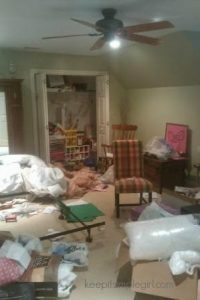 This room is a clear representation of how emotional clutter can manifest itself through physical clutter. So how did I attack this room? 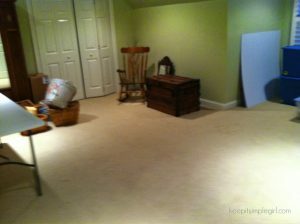 By using several of the 10 DeClutter Tips, I was able to restore this room to it’s natural order. 1. Take one area and focus only on that area; it can even be a category. For example, in my room, I took out all the boxes and either broke them down or put a couple aside to be used later for storage or give away. Once that was done, I focused on a square foot under the window. 2. Set aside time. I had to schedule the time to get this task done……things that are scheduled normally get done. 3. Find homes for all the objects. Many things in my room had homes, I just had not taken the time to put them there. 4. Make a decision. “Clutter is the result of delayed decision making”. Be willing to make a decision and quit hanging on to things…..just because. 5. Visualize the end goal. Don’t start anything without an end goal in mind. My goal was to bring order to the room and to be able to vacuum the floor! 6. Work in short spurts. Working for about 25 minutes at a time, taking a timed 10-minute break, then working for another 25 minutes will help you not burn out so easily. to be relocated and a box for items to donate. 8. Put on some music. It feels more fun to have some music going. Snow White and the Seven Dwarfs had it right when they sang whistle while you work! 9. Don’t organize clutter. Organize and label only what is really necessary to keep. 10. Don’t buy storage containers until you know exactly how much of something you are going to keep and where you are going to store it. When you buy storage containers, you don’t end up using, you have only added to the clutter. Now, figure out what area of your home is causing you the most stress and apply some of these tips. Today just might be your day for a new beginning!